The mass extinction threat of my 1980’s childhood was not climate change but nuclear war. It’s a Sunday evening and my parents are driving us home from my grandmother’s house. My three brothers and I are in the back seat, squished thigh to thigh. I’m looking out the car window into the chilly, Scottish dark, at the gleaming eye of a full moon. I make-believe it’s following us home, and wonder at the way its whiteness casts a perfect, circular aura into the night sky. 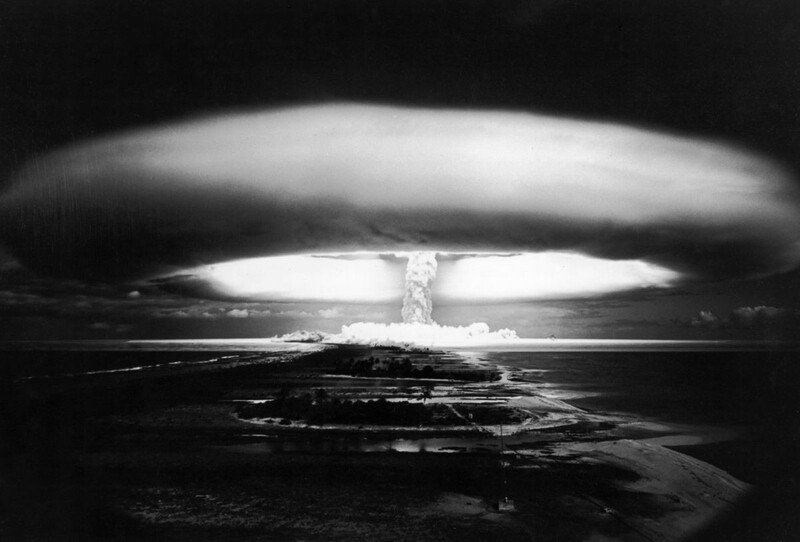 I drift off to sleep when *boom*, my subconscious mind throws up an image of a nuclear bomb going off, just as I’ve seen on black and white footage on the little television in our living room. I’m nine years old, my heart pounding, my body shaking from idea of a world exploding outward with a fiery blast that incinerates people and buildings and trees, then shrieks back in on itself, erasing even the ghosts it left behind. The childhoods of both Baby Boomers and Gen-Xers were blighted in this way, with ever-present fears of nuclear apocalypse. Worse than dying from a hydrogen bomb though, was the prospect of surviving it, and enduring the bitter nuclear winter to come. My own anxieties became conflated with scenes from James Herbert’s book ‘The Rats’, which I found on my dad’s bookshelf and read when I was much too young. According to Wikipedia, it contains ‘graphic descriptions of death and mutilation’. I can safely say it didn’t help my mental health. We were moving forward, joyfully into the new decade of the 1990’s. For a few years, we could breathe with a glimmer of hope, without thoughts of plutonium ‘twinkling in every lung’. The impassive eye of the moon no longer glared down coldly, reminding us that one day we would all be extinguished in the glowing embers of a nuclear furnace. We came out of our psychological bomb shelters and went about the business of our lives. In Scotland, Gen-X women like me focused on getting our degrees, and putting off having a family. My dad, a Baby Boomer who’d immigrated to America, celebrated his 40th birthday party with gusto, entertained by a lady in a belly-dance costume. “She’s not a stripper” my mum explained, “it’s an art form”. Ironically, we were having a blast. We didn’t know it was a brief reprieve between wars, new horrors of genocide and burgeoning existential threats to our survival as a species. We had no idea that we would soon throw away our Kate Bush records and replace them with Tori Amos CD’s. How could we?